Binding Deceit, the 3rd book in the Undead Bar Association Series, publishes April 22, 2013. Today I'm revealing the cover art, and more. I'm sharing the background of how the cover is made. 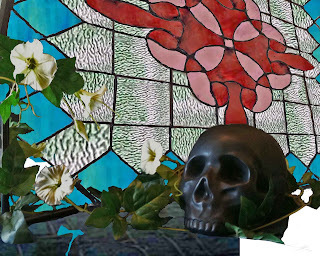 In the foreground sits the mascot and cover boy of the Undead Bar Association, our darling skull, Skully. Wrapped around Skully, in full attack mood, we find a bindweed vine. 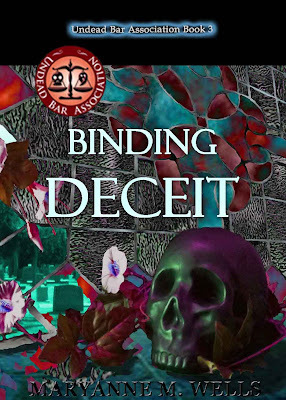 Bindweed figures prominently in the Binding Deceit story, to the point it inspired the final title. That's the beginning of the cover's foreground. Now we've collected the pieces. Let's put them all together in Photoshop, add a large dose of imagination, and make it work. Here we see everything layered, color added, and the first piece of glass broken out of the window. Next, we broke out some more glass, strategically, so it looked like the bindweed vine was responsible for the damage. 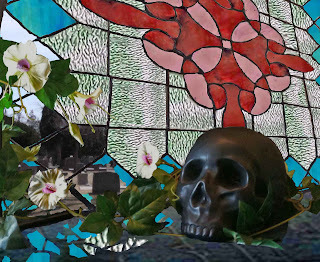 This revealed the cemetery on the other side of the window. Also, we added toothy maws to the open bindweed flowers. Now, for the fun part and some little touches. We went crazy with creepy color, added shadows under the skull and bindweed leaves, and cleaned up some of the glass and foliage. There you are! 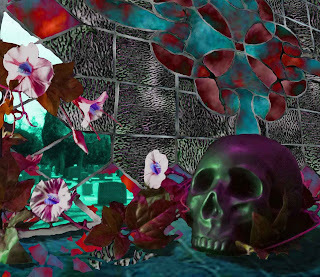 Cover art from photos, directly inspired by the book. Look for Binding Deceit on April 22.